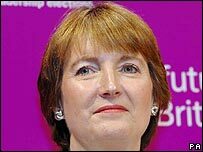 Harriet Harman has urged her Conservative opposite number Theresa May not to give her a "handbagging" in her new role as Commons leader. The pair clashed during business questions after Mrs May asked Ms Harman to clarify her stance on a string of issues from Iraq to City bonuses. Mrs May was also reprimanded by Speaker Michael Martin after she called Ms Harman a "part-time" Commons leader. Ms Harman called for a "non-aggression pact" with her Tory opposite number. The Conservatives have already taken to calling Ms Harman "Four Hats Harman" as she juggles her new roles as Labour's deputy leader, party chairman, leader of the Commons and minister for women. Mrs May faced Ms Harman across the despatch box for the first of their weekly business statement sessions, during which MPs on all sides can suggest topics for debate. After being warned by the Speaker for referring to Miss Harman as a "part time" commons leader, Mrs May accused her opposite number of appearing to contradict Labour policy during the recent deputy leadership campaign. She called for Commons debates on social responsibility, City bonuses, party funding and the renewal of Trident nuclear weapons - all areas where she suggested Ms Harman had been in conflict with the party's official position. She also called for a debate on "honesty in government", claiming Ms Harman had agreed during a BBC Newsnight debate that the government should apologise for the Iraq war. "Subsequently she said 'I never said the government should apologise for the Iraq war'," Mrs May told MPs. "When I raised this in the House on Monday, she was careful not to repeat her denial on the floor of the House. "So will she now make a statement clarifying her position. Does she stand by what she originally said or does she refute it?" Ms Harman said Mrs May could "use opposition days" - Parliamentary time given to opposition parties to set debates on issues of their choice - to raise matters such as Trident, party funding and honesty in government. She told Mrs May: "I would like to offer her a non-aggression pact. I would say it is not in the interests of this House for her to be trying to give me a handbagging every Thursday."